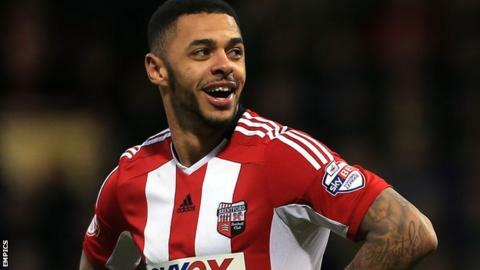 Burnley have signed Brentford striker Andre Gray for an undisclosed club-record fee, believed to be £9m. The 24-year-old striker has signed a three-year contract with the Championship club. Gray turned down a move to Bristol City after they made a similar bid, while Hull City were also interested. The former Luton player scored 18 goals last term as Brentford reached the Championship play-offs, and has netted in both games so far this season. "Andre is a player who we have been aware of since his Hinckley Town days in non-league," manager Sean Dyche told the club website. "He has worked very, very hard to get to the level he's at. He has risen up the ladder and, in many ways, had a similar pathway to two former strikers here - Danny Ings and Charlie Austin. "In that respect there is a rawness, a hunger and a great desire from him to continue his education and go even further, and we intend that to be with us in the immediacy and also in the future."